Low-emission-zones (LEZ) is Europe’s most aggressive recent air pollution regulation: only vehicles that emit low levels of air pollutants are allowed to enter these areas. In Germany, vehicles are categorized into four mutually exclusive classes based on their emissions. Overall, 46 million German cars, buses and trucks are required to display a colored windshield sticker indicating the vehicle class. As of 2010, 41 German cities have implemented LEZ, in which certain vehicles classes are banned. However, this practice is heavily debated as opponents argue that bureaucratic costs are too high, while environmental gains are too little. In a new IZA discussion paper, Hendrik Wolff shows that this critique is not valid: LEZ have significantly improved air quality in German cities as fine dust pollution on main streets decreased by nine percent on average. In contrast, in residential areas or parks, there is often times no significant effect of LEZ on air quality. Surprisingly, other measures to reduce air pollution, like building ring roads or advertizing public transport, had no positive effect. Moreover, Wolff refutes the common argument against LEZ that owners of dirty cars avoid upgrading their vehicle by driving around the low-emission-zones. 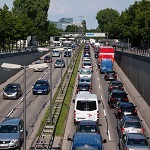 Overall, the study estimates a net benefit of LEZ of about one billion dollar in Germany: while the health benefits are worth two billion dollars, upgrading old dirty vehicles approximately costs one billion dollar.